I love the Internet! I found myself with an aging eggplant and some aging mushrooms that had to be used quickly. So I googled “eggplant mushroom recipe” and found more than a dozen possibilities, including this one, originally posted by Amy Wisniewski on chow.com. 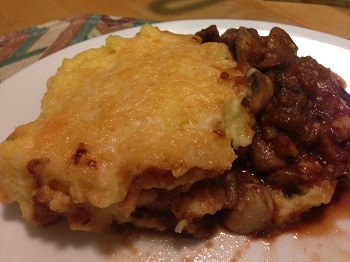 It was described as an “Italian take on a vegetarian shepherd’s pie.” It’s a little time-consuming to make because there are a lot of steps, but it’s not difficult, and it’s delicious. You can easily halve the recipe to serve 3 or 4. If you do that, you can use a smaller skillet, but for the first step, you may want to roast the eggplant on a baking sheet because a smaller skillet may not be big enough to hold the eggplant before it’s cooked. I made half the recipe. I roasted the eggplant in a 10-inch skillet before I realized it would be too large, then used an 8-inch skillet for the rest of the process, and it was perfect. You can use regular cornmeal, like I did. If you don’t have fontina cheese, substitute Swiss, Monterrey jack or cheddar. Half the recipe made four good sized servings. There are only two of us so we had leftovers, and it was good reheated too. Preheat oven to 350 degrees and place a rack in the middle. 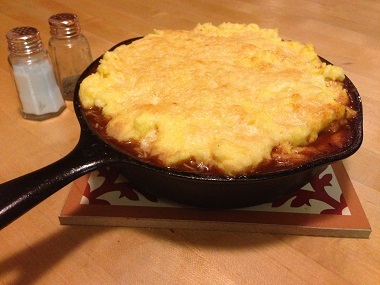 Place a large, well-seasoned cast iron or enameled skillet in the oven while it is heating. When the oven is hot, drizzle 1 Tbs. of oil into the skillet and let it heat for a few minutes. Add the eggplant and arrange in an even layer. Roast until tender and starting to brown, about 25 to 30 minutes, stirring once. Remove the skillet from the oven to the cooktop. Transfer the eggplant to a large bowl and set aside. Add 1 Tbs. oil to the skillet and place over high heat for a minute. Add the mushrooms and cook, stirring occasionally, until the mushrooms are browned, 5 to 8 minutes. Transfer the mushrooms to the bowl with the eggplant. Add the remaining 1 Tbs. oil to the skillet and heat for a minute. Add the onion, oregano and red pepper flakes and season with salt to taste. Cook, stirring occasionally, until the onion is soft and just beginning to brown, about 5 minutes. Add the garlic and cook, stirring, another minute. Add the olives, the reserved vegetables (along with any juice in the bowl), the tomatoes and water, and season with salt and pepper to taste. Reduce heat to low and continue to cook, stirring occasionally, until the mixture thickens slightly, about 20 minutes. As the stew cooks, start making the polenta. Place 3 cups of water and the milk in a saucepan and bring to a simmer over high heat. Reduce the heat and slowly pour in the polenta or cornmeal while whisking or stirring, until all the polenta is incorporated and there are no lumps. Cook, stirring frequently, about 15 or 20 minutes, until the polenta pulls out from the sides of the pan and the grains have softened (if it gets too thick before it is soft, add a little hot water, ¼ cup at a time). Stir in the Parmesan cheese. Heat the oven to broil; keep the rack in the middle. Pour the polenta over the eggplant and mushroom mixture and spread it into a smooth, even layer. Evenly sprinkle the fontina cheese over the polenta. Place the skillet in the oven and broil until the cheese is browned and bubbling, about 4 or 5 minutes. Remove from the oven and let it sit for 5 minutes before serving. We had a great breakfast today! I don’t make this too often because it takes about an hour (most of it for baking), but it’s just the thing for a lazy winter Sunday. I first saw this recipe for Michigan Baked Oatmeal in a newspaper. I cut it out and tried it, and then lost the clipping, so I searched online for it. 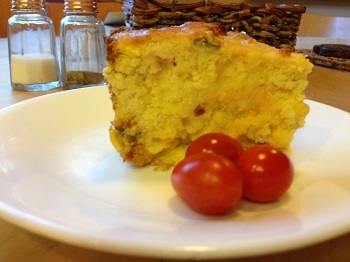 The same recipe appears on many recipe sites – probably because it’s so good! 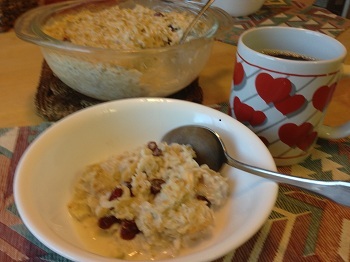 With oats, apple, nuts and dried cherries and lots of milk, it’s very healthy and may be a good way to get picky kids to eat a healthy breakfast! Since there are only two of us at home most of the time, I usually halve the recipe; the only tricky part is finding a small apple or using only half of a large apple. If you don’t have dried cherries handy, you can easily substitute Craisins or any other dried cranberries. And you can vary the recipe by using vanilla or cinnamon instead of almond flavoring and use different dried fruits or nuts. This recipe is quite sweet, so you can cut back on the brown sugar if you like it less sweet. Michigan Baked Oatmeal keeps well for a few days in the refrigerator and can be reheated in the microwave with a little additional milk. Preheat oven to 400 degrees. Coat a 3-quart baking dish or casserole with cooking spray. Combine all the ingredients in the baking dish (add the milk last) and stir well. Bake uncovered for 45 minutes and serve hot. I got this recipe from the New York Times, and loved it because it’s so easy – no need to cook the mac or make a cheese sauce. The original recipe said not to use skim milk or lowfat cottage cheese, but that’s what we usually have on hand and so that’s what I usually use – and it comes out great. The recipe uses so much cheese that I figured I’d save calories where I could! I use an immersion blender to mix the milk, cheeses and spices. Heat oven to 375 degrees and position an oven rack in upper third of oven. Grease a 9-inch round or square baking pan with 1 tablespoon of butter or margarine (or use cooking spray). In a blender, or with an immersion blender, purée the cottage cheese, all the cheese except for ¼ cup,the milk, mustard, cayenne, nutmeg, salt and pepper together. You’ll use the reserved ¼ cup grated cheese for topping. In a large bowl, combine the milk-cheese mixture and uncooked pasta (or you can combine them right in the baking pan). Pour into prepared pan, cover tightly with foil and bake 30 minutes. Uncover the pan, stir gently, sprinkle with reserved cheese and paprika and dot with remaining tablespoon butter. Bake uncovered 30 minutes more, until browned. Let cool at least 15 minutes before serving.